AutoCAD Pricing from AxonWare. Get AutoCAD LT 201912 Month Desktop Ne. Order Online from the leading AutoCAD discount reseller in Europe. Ph: +353 1 6535178. AxonWare the best place to buy AutoCAD. When you order AutoCAD LT online form AxonWare - you'll get your serial number and link (usually within 12 hrs weekdays). For a limited time you can buy a new AutoCAD LT 12 month subscription form AxonWare. Hurry this is a limited time offer! Why pay a big capital outlay for a perpetual license that will be old in a few months. Autodesk will no longer offer upgrade pricing at all. The only way to move to a current version would be subscription renewal or this 12 month license. • Easier to manage your licenses. (Dont have to go hunting for old serial numbers when you want to upgrade). Log back into your account to retrieve your license. • Your accountant will love you. If you buy plant & machinery it usually has to to be depreciated over 8 years. However a desktop subscription (rental) for 12 month would normally be expensed to the P&L in the year you buy. AutoCAD LT drafting and detailing software delivers the powerhouse 2D documentation, collaboration and productivity tools that you need, on both Windows and Mac platforms. With a focus on ease and efficiency, AutoCAD LT builds on feature advances with enhancements so intuitive that you will wonder how you worked without them. Create drawings using the latest DWG technology for file format compatibility and reliability. Further advance the way you work by extending your desktop to store, share and access designs seamlessly synced to Autodesk Cloud. And with AutoCAD® WS web and mobile application, you can use mobile devices to connect to and collaborate with colleagues virtually anywhere. When does a Desktop Subscription begin? The Desktop Subscription begins when you receive the order confirmation email. What is a Named User, and who can be assigned? A Named User is one who is assigned to use a Desktop Subscription license. Users are assigned based on their Autodesk ID, which is associated with that individual’s email address and gives them access to Desktop Subscription software and benefits. Named Users can't share their Autodesk IDs with others, and they must be an employee or on-site contractor. Consult the Autodesk Subscription Terms and Conditions for more information. As employees join or leave your company, you may need to reassign Desktop Subscription software to another user. Reassigning the Named User is permitted, subject to Autodesk Subscription Terms and Conditions. After I purchase Desktop Subscription, how do I get started? 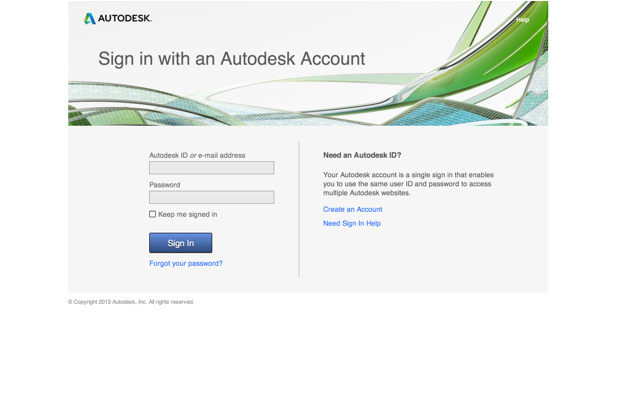 After your purchase, you'll receive an email with a link to the Autodesk Account sign in page. Login using your username and password (or the temporary username and password created for you). After you sign in, click "Account" in the top navigation to land on the Products & Services page. This page includes all products and services you have purchased as an administrator and/or are entitled to use as an end user. Locate your software in the list to find options for downloading and installing. This is also where you'll access cloud services. You will need to login using your Autodesk ID the first time you launch the product. To view your shared or individual cloud credits usage, click on "Reporting" in the left navigation. In the Usage Report by Contract, expand the contract to view the breakdown of usage per Service and export a detailed .CSV report of all cloud credits used by date. If you need more credits, click "Get more cloud credits" to go to the Autodesk Store to purchase 100-packs; alternatively, you can contact your Autodesk reseller to purchase more. Does the software included with Desktop Subscription require an internet connection to work? For the initial installation and login, an internet connection is required. After installation, the software will work offline for up to 30 days, at which point you must connect to the internet to continue. You will be reminded 7 days prior to having to connect to the internet in order to continue using the software. An internet connection is required in order to access cloud services. Does the Desktop Subscription software sit in the cloud or on my desktop? Desktop Subscription software is installed on the desktop in the same manner as traditional perpetual-license, desktop products; it does not run in the cloud. Many Desktop Subscription offerings include access to cloud services that are not installed on your desktop; for example, rendering. Cloud services do run in the cloud and require an internet connection. As an administrator, how do I give other users access and track cloud credit usage? For more information on about assigning and managing users, usage reports, tracking cloud credits, and more, please visit theSubscription Managementpage. Where do files created using Desktop Subscription software reside? Files and projects created with Desktop Subscription software are saved locally. Although an actively licensed Autodesk software product is required to open and edit files, you retain all your local data. Is there any difference between files created with Desktop Subscription software versus those created with perpetual-license software? No, there is no difference between files created with a perpetual license or Desktop Subscription version of a product. They are 100% compatible with each other. What happens to data stored in the cloud if a Desktop Subscription is not renewed or is terminated? Cloud storage continues until the end of the billing cycle, at which point all documents stored in the cloud remain available for an additional 30 days. If your subscription has expired you can continue to access and view existing designs and files during this period, but you will not be able to edit or add information to the files. After 30 days, your account will revert to the free offering and cloud storage limitations will be reduced from 25GB to 5GB. AutoCAD LT is the 2D design and drafting software used by design professionals who require full DWG file format compatibility but do not require 3D or need to customize their software through automation. AutoCAD LT software lets you design, visualize and document your ideas clearly and efficiently. Autodesk redesigned the user interface of AutoCAD LT software to accelerate tasks, allow commands to be easily found and help rapidly train new users. AutoCAD LT from Autodesk helps customers in the building, manufacturing, infrastructure, digital media and wireless data services fields increase the value of their digital design data and improve efficiencies across their entire project lifecycle management processes. Many firms are choosing this as a low cost alternative to AutoCAD. Reports so far have been quite good. There is a free trial download on our site. Advance the way you work with Autodesk® 360 cloud-enabled services. With AutoCAD LT, you can automatically store design files online and access them from almost anywhere. Review and mark up 2D DWF™ files through a web browser or with a mobile device. And with cloud storage, you can easily share files, keep track of file updates and invite others to comment on designs. Using the customization sync feature in AutoCAD LT, you can make your custom settings and files available on any computer via your Autodesk 360 account. Benefit: Extend your desktop with the cloud computing capacity of Autodesk 360. Providing native support for DWG technology, AutoCAD LT for Mac helps you to more accurately and efficiently document and share designs. With the robust tools you expect from AutoCAD LT—along with an intuitive Mac OS® X interface, using features such as Multi-Touch Gestures and Cover Flow—it’s easier than ever to create design documentation on your platform of choice. Boost productivity with the help of timesaving capabilities such as associative arrays, object snaps, xref support (including PDF) and the Project Manager. Licensing entitlements give you the flexibility to activate either the Windows or Mac version of AutoCAD LT, regardless of which OS version you purchased. Benefit: Flexibility to work on your preferred operating system. Benefit: Streamlined collaboration with colleagues and clients. AutoCAD LT software introduces an updated file format to accommodate technology and performance improvements in the software. AutoCAD LT is compatible with all previous versions of AutoCAD LT and AutoCAD drafting software and allows you to save drawings in a wide variety of other formats, ranging back to R14 DWG and R12 DXF™. Also, the DWG technology used by AutoCAD LT is shared by the industry specific versions of AutoCAD, maximizing compatibility and interoperability. AutoCAD LT is supported on the latest Windows®-based workstations, including those with 64-bit processors and the Windows 7 operating system, while AutoCAD LT for Mac is supported on Mac OS X Lion. Benefit: Confidence in the compatibility and stability of your hardware and software. The AutoCAD LT user interface is even more intuitive and easier to use. In addition to multifunctional grips, contextual ribbon tabs help put commands at your fingertips. When you start certain commands or select certain objects, the relevant commands and objects automatically appear at the top of the screen. Even the familiar command line offers more functionality and configuration options in AutoCAD LT , including auto-complete of command names and system variables and clickable options within active commands. Benefit: Spend less time searching for commands and features. AutoCAD LT includes useful features that previously were available only in the AutoCAD full version. The Sheet Set Manager (Project Manager in AutoCAD LT for Mac) organizes your drawing sets and keeps them up to date. With it you can manage layout views, detail titles and scales and sheet names and numbers from a single palette. The Delete Duplicates command cleans up drawings by removing redundant and unneeded geometry. And the Nested Copy tool enables you to copy items out of blocks or external references directly into your current drawings. Benefit: Better drawing management, cleaner documents and more flexibility when working with blocks and references. Associative arrays add timesaving functionality by enabling better maintenance of relationships between objects, like windows on a building or trusses on a bridge. You can edit a single, associative array more easily: change the spacing or number of rows or columns, adjust the path shape and even modify or remove individual items without affecting the overall associativity. In AutoCAD LT a contextual ribbon tab available during array creation makes the command even easier to use. New properties for path arrays enable you to specify whether to maintain a fixed number of objects, or to automatically adjust the count based on path length and item spacing. Benefit: Easier exploration of design concepts and faster modification of arrayed objects. Use PDF files as underlays in your drawings just as you would any other supported file type. If the PDF is vector-based, you can use object snaps to locate new objects relative to geometry in the underlay. You can also create high-quality PDF files from your drawings, with high resolution, low file size and searchable TrueType text. Benefit: More options for collaboration and higher quality when sharing PDF files. Always check Vendor site for most updated technical specs. Dealt with my AutoCAD LT issue in a timely and efficient man ..